Ya know, I've never been one to read through the big, monthly Previews catalog in search of the what's coming up from Marvel and DC. Instead, I focus my attentions on the stuff in the back; the small press titles and the books no one has ever heard of. I figure, whatever Marvel and DC are doing, it's being highly publicized anyway, and most stores are going to order those books in big enough quantities that I don't have to pre-order. I typically glaze over while flipping through the first 75-or-so pages of Previews, slowing down every once in a while to order a Goon trade, or a Hellboy mini-series. It used to be that I'd flip through the Image Comics section, mostly to get to the page with the McFarlane baseball toys. Well, over the past year-plus, that's changed, big time. I've spent a lot more time looking through Image's solicitations, and I've pre-ordered more Image titles in that year-plus than I had in the previous five years, combined. And one thing has become crystal clear to me: Image Comics continues to publish the best range of genres in the comics industry today. From Chew and Skullkickers and Morning Glories to The Walking Dead and Infinite Vacation, Erik Larsen's company just knows good comics when they see them. And, last week, I stumbled upon yet another high-quality, creator-owned book that's being published through Image. 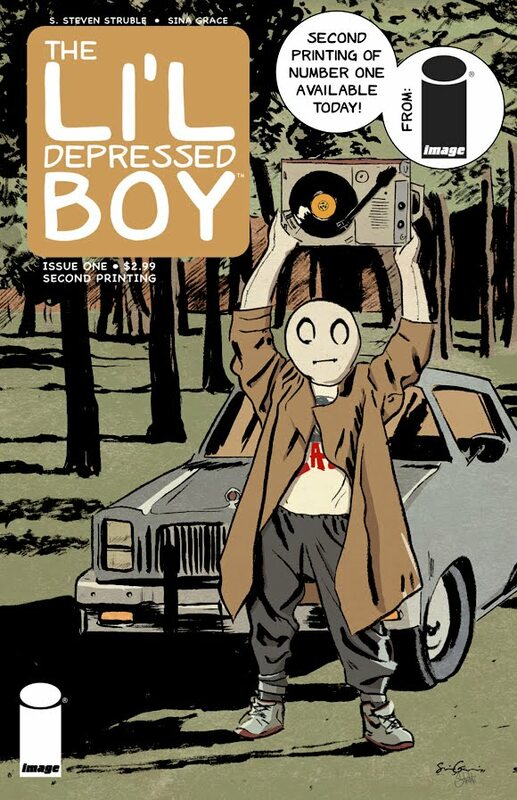 Li'l Depressed Boy, issues 1 and 2 shipped over the last two months, and issue one sold out completely. The second printing (cover below) came out last week, and more shops are starting to pick up on how good this book is. 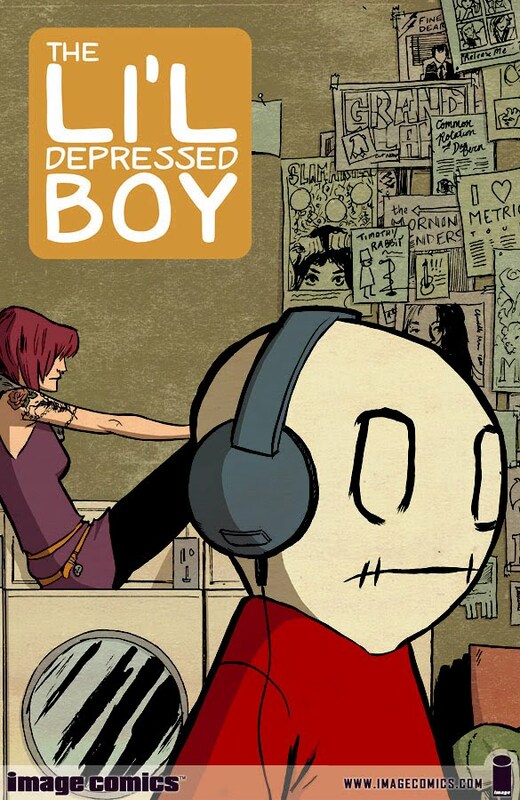 Written by S. Steven Struble, and with art by Sina Grace, Li'l Depressed Boy started out as a webcomic featuring Struble's poetry over artwork by such indie gods as Jim Mahfood and Sam Keith. It's progressed into this latest printed version, and that's where I picked things up. I actually missed out on the first issue, grabbed issue two because I was struck by the cover, and put in a quick order for the second printing of issue one. I had the chance to read them both this weekend, and let me tell you. This series is an absolute gem. Amidst the multitude of pop-culture references (including, Nathaniel, a Mega-Man mention) there's depth in the storytelling, and wonderful, subtle details in the art. The main character, LDB, is, literally, a ragdoll. And he's depressed. There's no doubt about that. Since reading issues one and two, I've gone back and read through the webcomic archives of the series, and there's no doubt that the character has a history of depression. The webcomic is certainly darker than the printed series has--at least in the first two issues--proven to be. Still, the printed issues are a wonderful way to jump on board, and to become acquainted with the characters and their world. LDB is a writer, a music lover, a video gamer, a comics reader. He's like our friends, he's like us. Or, at least, parts of him are like parts of us. He's anti-social, but still manages to function. He has one close friend, and the two of them hang out. He's single, but he's met a girl. It's always hard to "review" a story that's only halfway finished, so instead of doing that, I'll say this: Give this book a try if you see it at your LCS. It deserves the attention of as many readers as possible. 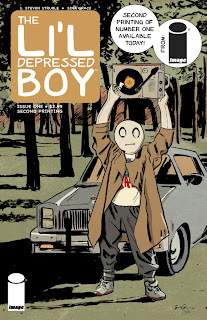 In THE L'IL DEPRESSED BOY #1, fans were introduced to that relatable titular character, LDB, as he seemingly looped through a series of those perfectly captured little moments of pop culture isolation and longing. He is awoken from his reverie by, ironically enough, the girl of his dreams. With the aim of burgeoning friendship, this intoxicating stranger pokes holes in LDB’s insular shell as he must learn to venture into the world outside of himself in order to keep up with her zest for life. If this sounds like it's your kind of thing, be sure to mention it to your comics shop owner, and pre-order the upcoming trade collection, which ships for under $10 this summer.